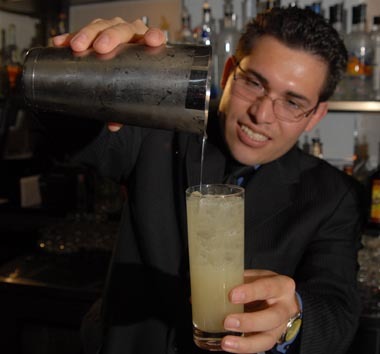 Junior Merino, The Liquid Chef. So really, this recap only reflects the past seven months of 2009 since I started this blog in May, but so much radness went down that I thought the time period deserved some pause–including one event I haven’t even recapped until now because life and too many cocktails got in the way (it happens to the best of us). Junior Merino’s Liquid Lab (November): Holy hole in a lotus root, if you have been to Junior’s lab you have truly tasted the rainbow. Primarily for bartenders, this free, day-long experience at Junior’s offices in the Bronx (sorry, no photos allowed) is a mix of mad cocktail science and blind tastings. On the day I attended, we tasted five different kinds of vodka, cachaca, rum, pisco, tequila, and mezcal, and we tasted everything twice. Tasting spirits twice (after lots of water and spitting) allowed my palate and brain to register more intense flavors. We then mixed cocktails using each type of spirit and pulled ingredients from Junior’s seemingly endless supply of liquor, liqueurs, juices, syrups, bitters, fresh produce and herbs, garnishes, spices, salts–really anything you could imagine, it was there. Each cocktail we made included at least one sponsored ingredient–Combier Orange Liqueur, Domaine de Canton Ginger Liqueur, and Castries Peanut Rum. Being an amateur mixologist, this was a real treat for me, as was tasting the more experienced bartender’s concoctions. My best drink (in my opinion) included: muddled pepquinos (tiny melons) and starfruit, habanero-infused Siembra Azul Tequila, Combier, The Liquid Chef Agave Nectar, lemon juice, and garnished with rock chives, starfruit, and The Liquid Chef Cactus & Lemongrass Salt on the rim. Some bartenders toyed with the liquid nitrogen, dry ice, and liquid smoke for more molecular experiments. A highlight for me was tasting the not-yet-released Creme Yvette, which offers a brilliant mix of berry and vanilla flavors. Another major highlight was the amazing lunch spread provided by Junior’s wife, chef Heidi. If you are in the NYC area and are a working bartender, this is an opportunity not to be missed. World Cocktail Day (May): The day I got this blog up and running, and what a day it was! More than 20 of the country’s top mixologists threw down at Pranna in celebration of the birthday of the cocktail. WhiskyFest New York (November): Where I learned that there is no such thing as too much whisk(e)y. Why can’t every day be WhiskyFest? 2nd Annual D.C. Repeal Day Ball (December): No better reason to put on a black-tie outfit than to celebrate the anniversary of Prohibition’s end–and no better place to celebrate than the D.C. cocktail hub. The Dizzy Fizz Holiday Puncheon (December): C’mon, you know I had to put the puncheon on here! If you were there, you know; if you weren’t, I’m sorry but you missed a damn fine time.